the Tree appearing at Phyllis' Musical Inn, Oct. 22nd, showtime 10:00 p.m.
First with tribe, and now with the Tree, we've been playing Phyllis' since 1986! Phyllis' is located at: 1800 W. Division St., Chicago, on the corner of Division & Wood, between Ashland & Damen, just West of the Kennedy expressway. Below, owner Clem Jascot w/drop-in guest, Mr. Spicoli. This chug-a-lug Reggae groove, features narration from Tree bassist Samuel Salathiel "Cha-Cha" Bradshaw, who taps the Book of Matthew & the Sermon on the Mount for some radical ethics lessons. 'Radical protest music from an unlikely source. He's manning the barricades, burning tires"
There's lots of attention these days on protest music, the legacy of Woody, saying something... So with this in mind we're posting some of Andrew's protest music. Going back to tribe in the late 80's (who covered Woody extensively), to the Tree's forthcoming album, Robb has written & sung out against injustice & oppression for decades now. For starters, check out 2 versions of Andrew's classic, "I Seen Tom Joad", written in '87, about the apparition of Steinbeck's hero in Reagan's America. The song was a staple of tribe's live shows, and a thematic pre-cursor to Springsteen's "the Ghost of Tom Joad", released in '95. ...this live version is from tribe's last concert, recorded at the Idful Studios in Wicker Park-Chicago, by Brian Deck. There were people from the Old Town School of Folk Music waltzing in the session room as we played it. Features Jimmy Tomasello on lead guitar, originally appearing on the "as-if" collection. ...from 2007's largely unreleased "the Long Haul", this is a straightforward acoustic version. The band is finishing up the long overdue "Low Hanging Fruit" project, and the subsequent world-wide release of this and the larger andrew & Tree catalogue, online. 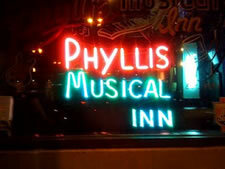 the Tree is playing the legendary Phyllis' Musical Inn on 10/22/16. Many luminaries will be there, to be sure!!! nearly everyone who listens to it! 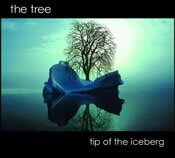 Hear "Tip of the Iceberg"